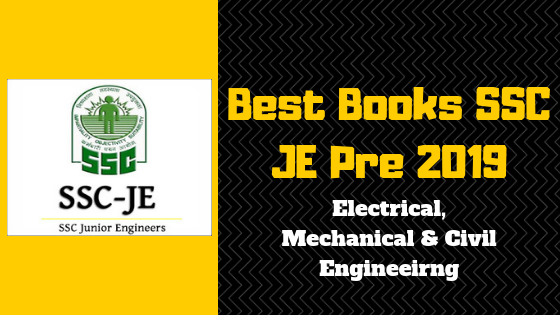 Best Books SSC JE Pre Exam 2019 Electrical, Mechanical, Civil Engineering. Best Book for SSC JE Preparation junior engineer exams Mechanical Engineering, Civil Engineering, Electrical Engineering. These all SSC JE books help all branch students who are preparing SSC je Exam. SSC JE books for electrical, mechanical, civil engineering students will help to pass this exam first attempt SSC JE books are best for crack this exam. My previous article for SSC JE 2018 Best Books loves by many students and this year SSC JE 2019 I provide you update article Best Books SSC JE Pre 2019 Electrical, Mechanical, Civil. Every year approx. 10 lakh students give SSC JE exams different engineering branch electrical, mechanical and civil engineering. Staff selections commission(SSC) invite application for recruitment junior engineer (Civil/ Electrical/ Mechanical & Quantity Surveying & Contract) Exam 2019 you can check for detail information previous article SSC JE 2019 Full Detail Official Notification. Many students who have passed diploma in civil electrical and mechanical branch wants government jobs, preparing SSC Jen Exam 2019. we know this year 2017 SSC JE result announced and many students passed this exam but many more students fail this because of they are choose wrong coaching or wrong books for study. My suggestion for all students who are preparing this exam choose best book here I am suggest you for SSC JE 2019 for pre and mains exams. You should buy these books online or offline bookseller. Engineering exams website provide you Best Electrical Engineering Self Study Guide Technical Books for SSC JE Exam 2019. If you are searching best books subjects wise study read previous website article Best Electrical Engineering Books For GATE 2019, IES 2019, SSC JE 2019 this article provide you all best books subjects wise. Here below tables provide you best technical Electrical Engineering work books, practice books, Self-Study Guide, full exams guide books, these books cover all subjects Electrical Engineering. All books Electrical Engineering contain with solved previous year papers, all subject’s objective and mock or practice papers. Engineering exams website provide you Best Civil Engineering Self Study Guide Technical Books for SSC JE Exam 2019. If you are searching best books subjects wise study, read previous website article Best Civil Engineering Books For GATE 2019, IES 2019, SSC JE 2019 this article provide you all best books subjects wise. Here below tables provide you best technical Civil Engineering work books, practice books, Self-Study Guide, full exams guide books, these books cover all subjects Civil Engineering. All books Civil Engineering contain with solved previous year papers, all subject’s objective and mock or practice papers. Engineering exams website provide you Best Mechanical Engineering Self Study Guide Technical Books for SSC JE Exam 2019. If you are searching best books subjects wise study, read previous website article Best Mechanical Engineering Books For GATE 2019, IES 2019, SSC JE 2019 this article provide you all best books subjects wise. Here below tables provide you best technical Mechanical Engineering work books, practice books, Self-Study Guide, full exams guide books, these books cover all subjects Mechanical Engineering. All books Mechanical Engineering contain with solved previous year papers, all subject’s objective and mock or practice papers. I hope Best Books SSC JE 2019 Electrical, Mechanical, Civil all books will help you to crack your SSC JE exam 2019 electrical, mechanical and Civil engineering. If you have any problem related to gate exam 2019 comment below I will help you. Like This Article Please Share with Your All Friends and Classmates.